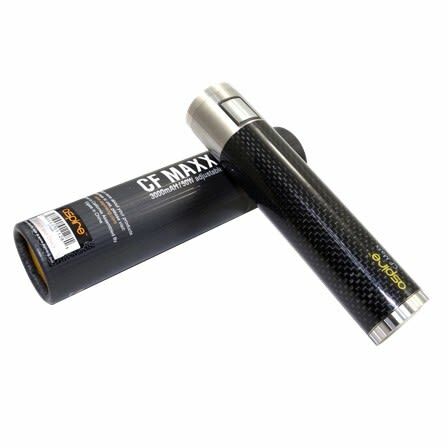 Aspire's newest addition to its line of CF batteries, the CF MAXX. 3000 mAh, variable wattage, and Sub-ohm. Now available, Aspire's newest addition to its line of CF batteries, the CF MAXX. 3000 mAh, variable wattage, and Sub-ohm. The newest Aspire CF battery, the CF MAXX gives you plenty of capacity at 3000mAh, and the same great durability we've come to expect from the Aspire CF line of batteries. It is variable wattage from 5W to 50W, and is Sub-ohm compatible from 0.3 ohm to 5 ohms, and has a max voltage output of 4.2V. The body and connectorpins are made of stainless steel, and the main part of the body is carbon fiber coated, making it extremely durable. The battery also comes with a USB charger, that you can use on your computer or with a wall adapter (sold separately). Materials : Stainless Steel, Carbon Fiber coating.